My curiosity peeked I dropped the post of this message whom I shall call Keith Bradshaw (real name on file) a note in a private message asking for more details. Checking the next day the post had been removed but Keith did reply to my private message. Keith made it clear from the beginning that he was worried about releasing these photos as they had been taken illegally and he regretted posting one of them on facebook. It did however tell me that there were taken at China Lake in California at about 11.30 am. I grew up in a town called Ridgecrest which is a U.S. Naval base in the Mojave Desert. As a kid it was very easy to get onto the base and everyone in town had passes that would allow you through the gates to get to school, swimming pools, the movie theatre etc. Everyone knew someone who worked on the base so you would get to know where the different parts of the base were. They had the bombing range and the radar range. I grew up with a kid who after High School joined the Navy. After he retired he moved back to town and got a job working in the civil service on the base monitoring radar. He said it was the world’s most boring job but he did tell me about interesting things that went on out there. Things like them having jeeps and tanks scattered all over the desert and then flipping a switch and they all would disappear. Turns out that’s what fiber optic camouflage does. People would talk about unbelievable things that turned out to be true. Planes would come from all over the world to use the radar test range out there. I have pictures of that too. Planes with markings from other countries. While I was in between jobs in 2007 I went back to town to visit some of my old friends. While I was in town I stopped by this friend’s house and after a few drinks he started telling me how that week he had been monitoring a flying saucer. When I asked him how he knew that’s what it was he told me- first of all, in all the years he had been doing that job he never had two generals and three other men with top security clearance recording and watching everything he did. He explained how it was very simple. There were two signals on the radar screen. One would appear very low in altitude, go up to a certain higher altitude and then click off. There would be a countdown for a certain amount of time- five; four, three, two, one and then it would click back on. When this happened the first time the people in the room got very excited. The object on his screen would lower in altitude until it was no longer on the radar, move to a different position and repeat the same thing over and over at different altitudes. All the while the other signal on the radar screen would remain constant. Curious as to what it was he was monitoring he asked around. People that he knew who physically worked on the radar range and would see what was out there told him that believe it or not it was a flying saucer. They described it as being shiny like a mirror and smooth like glass all over inside and out. It had no doors or windows only a hole cut in the top (I got the idea that the hole had jagged edges like it was cut with something) they described the inside as only having three small seats surrounded by a bird nest of fiber optic cable. The seats were molded out of the floor rather than attached to the floor. This thing was one piece with no seams anywhere. Keep in mind that description is just a rumour as to what it was like. He didn’t actually see it himself he was just told that’s what it was. Being in between jobs and having nothing to do the next day I made my way out there. ( I’m not telling you how I was able to get there but I will say I walked a very long distance) as I got closer I could hear a helicopter so I peeked up over a hill and down in the small valley below sure enough I could see this silver disc out there. There were a few tan-colored trailers and other military vehicles on the North End of the valley. This thing would wobble along close to the ground very unstable. I don’t believe anyone could have been riding on the inside but got the idea that helicopter was remotely controlling it. It was very wobbly as it moved along close to the ground and then it would freeze in position, go up to a certain height and sit there for a few minutes perfectly still. It made no noise that I could hear over the helicopter. It would go back down and wobble to the next position. It looked like whoever was controlling it was having fun with it sometimes because they would do little tricks with it. Like one edge would be pointing towards the sky and then it would do a U-shaped flip to where the other edge was pointing towards the sky then back down and wobble along the valley floor close to the ground to its next position. At first I was too afraid to take any pictures but then it got really close to me so I started snapping some photos figuring that if I was going to be caught I might as well have some pictures. I also took a short video but then to save space on my camera I started deleting the blurry pictures. I spent maybe 10 minutes total watching this thing. I then turned around and got out of there as quickly as I could. I took my shirt off thinking the color of my skin would blend in with my surroundings better than the color of my white shirt. About halfway back I got scared and hid the camera in the desert. That night I went back over to my friend’s house and when I told him what I had done he laughed in disbelief until I told him the path this thing followed from the North-West side of the valley to the South-East. When he realized I was telling the truth he got very angry and threw a plastic cup at me. He basically chased me out of the house telling me never to go get those pictures. I let them sit there for two days and then went back and got the camera. When I looked at the pictures there was no video and I realized that what I thought was a blurry picture was actually a blurry video that I deleted. I still kick myself for that one every time I think about it. A few years later I went back to town and ran into him at Walmart and he pretended he didn’t even know me. This is someone that I have known my whole life. We went to school together and played on the same Little League baseball teams. Well, an interesting story and interesting set of alleged UFO photographs. Of course you cannot just take the photographers word for it that the photographs are what he says they are. With this in mind I sought out a number of people who could undertake analysis of these photographs. The first was Jason Gleaves in the UK and this is his full and unedited report with comes complete with five computer photographs highlighting the points in his report. 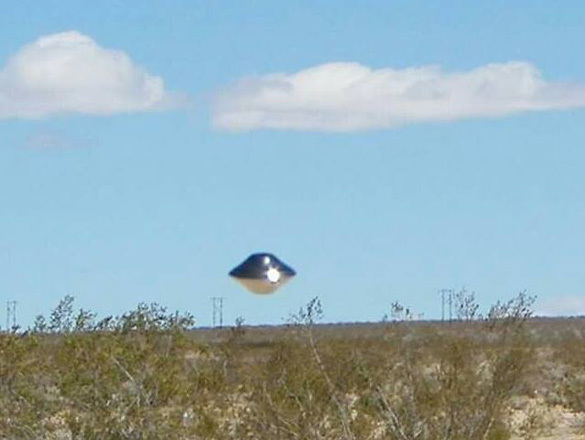 Metallic Disk Shaped Object Captured Near the U.S. Naval Air Weapons Station, China Lake, California, U.S. 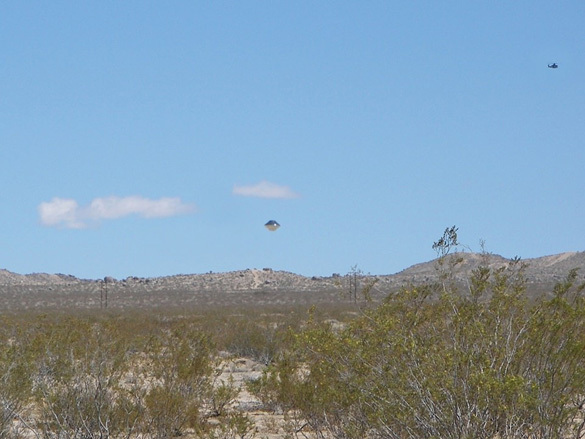 I was asked by Philip Mantle if I could conduct my own analysis on five interesting UFO images captured of a Disk Shaped Object (metallic in appearance) which appeared to be stationary appropriately 50-60 feet above a desert environment (location unknown at this point). 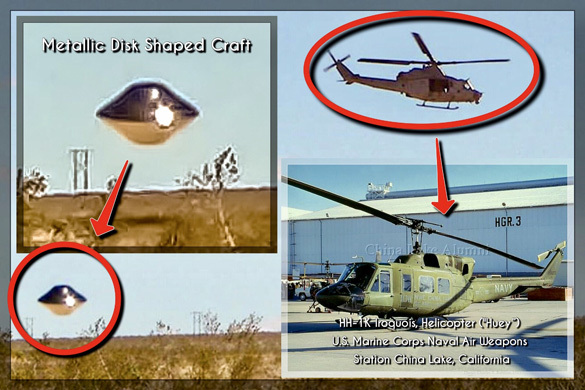 Also in another image a helicopter (HH-1K Iroquois, helicopter (“Huey”) is also captured in flight above the right side of the object and appears to be passing slightly behind (speed unknown). First appearance the images looked authentic but with technology of today and software (photoshop etc) you really can’t rely on image authenticity, no matter how good it looks. 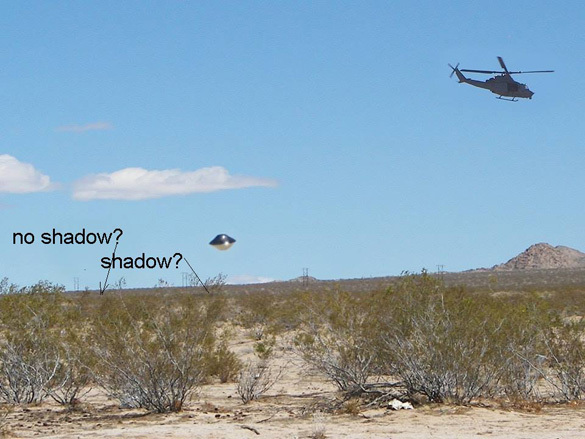 More detailed enlarged and enhanced images of the metallic object appear to show sunlight and consistent reflections on the body of the object, plus in one of the images a dark oval shadow is clearly seen directly below the object again consistent where a shadow would be (without actually seeing where the Sun location/position is in relation to the object, it’s always difficult to give a more accurate Sun-object-Shadow location). 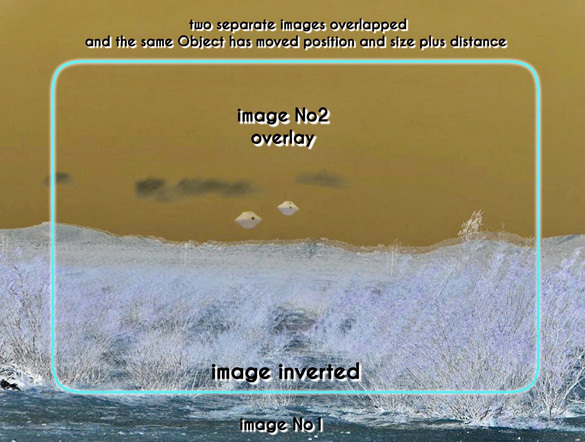 I also produced a twin layer image overlay of two separate images (taken from approximately the same position/location) to see if the object had moved from its original position, I aligned the two images, to the best of my ability with similar reference points (background mountain range and cloud formation, horizon). Upon viewing the final enhancement of the overlay the Disk Shaped Object is clearly seen in two different positions, both at slightly different altitudes and one further away in relation to the other regarding their relevant positions within the two separate photographs. A few days passed and a more detailed report and witness statement emerged giving the sighting location as (U.S. Marine Corps Naval Air Weapons Station China Lake, California, U.S.) this is also consistent as to the type of military helicopters reported and documented being operational in that region, and similar to the Helicopter captured in the images. Analysis by Jason Gleaves @Ufonly (Facebook, Twitter, Google+ and Ufonly YouTube) I am Ex-Royal Air Force, BAE Airbus division, I contribute on numerous UFO pages and have carried out Photo/image/video footage analysis on UFO’s and anomalies for many ufologists within our community worldwide. 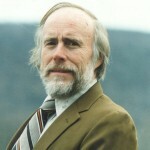 Another and perhaps more well known expert in the analysis of alleged UFO photographs is Dr Bruce Maccabee in the USA. Bruce is well known for his work on analyzing alleged UFO photographs. Dr Maccabee received a B.S. in physics at Worcester Polytechnic Institute in Worcester, Mass., and then at American University, Washington, DC, (M.S. and Ph.D. in physics). In 1972 he began his career at the Naval Ordnance Laboratory, White Oak, Silver Spring, Maryland; which later became the Naval Surface Warfare Center Dahlgren Division. Dr. Maccabee retired from government service in 2008. He has worked on optical data processing, generation of underwater sound with lasers and various aspects of the Strategic Defence Initiative (SDI) and Ballistic Missile Defence (BMD) using high power lasers. My immediate impression was that the orientations of the main rotor and tail rotor blades were very much the same. What would the chance of getting the same orientation in two pictures probably many seconds to minutes apart? See the pictures A and B below. Using the position change of distant land features I estimate that the camera pointing direction has rotated to the right by about 9 degrees (based on an assumed angular picture width of 35 degrees). The UFO has also moved to the right about 7 degrees and the helicopter moved about 11 degrees to the right. The helicopter image in B is nearly the same as in B, but the pictures are not identical. The helicopter is about 10% farther from the camera in B and there is a helicopter body rotation to the left of some (10 or so?) degrees. The lack of blur of the main rotor blades plus the nearly identical rotor blade orientation suggests a hoax with a model helicopter. The nearly identical position of the tail rotor blades also suggests a hoax but the blur of the tail rotor blades argues against a hoax unless one used a model with a rotating tail rotor. Note that the blur width of the edges of the tail rotor increases in going from the center (axle) outward to the end. This is exactly what one would expect of a rotating blade and is exactly what appears to be missing from the images of the main rotor blades. A “fast shutter” (very short exposure time) can “stop” a moving object so that it moves very little during the exposure time. Therefore, if one could establish that the exposure time was short enough to effectively “stop” the motion of the main rotor while not being fast enough to “stop” a much faster tail rotor, one could explain this situation. How fast would the shutter have to be? That depends upon the rotor rate and radius (distance of the end from the axle). Consider, for example, a rotor rate of 360 revolutions per minute or 6/sec, The outer end of the rotor travels at 6 x 2 pi radians per second = 37.7 radians/sec. Assume a radius of 15 ft. The outer end of a blade is traveling at 37.7 x 15 = 565 ft/second = 6,786 inches/sec. Assume the blade is 1 ft wide at the outer end. To avoid noticeable motion blur the blade should move less than 1/10 its width or less than about 1 inch during the shutter time. So, what is this shutter time needed to register the image of the blade without noticeable blur? The answer is (1/6786 sec/inch) x 1 inch = 0.000147 seconds, much faster than any typical video camera shutter. This analysis raises questions: (1) the near identically of the image of the helicopter in two separated-in-time frames suggests a “set up” (hoax)’; (2) the lack of blade image smear suggests very fast shutter or hoax; (3) the tail rotor blur suggests real event because difficult to hoax the blur that increases with distance from the center; There appears to be a faint slightly dark shadow under the UFO in Picture A which is not in Picture B (consistent with real) and there is only the barest hint of a shadow under the UFO in Picture B that is not there in Picture A (consistent with real. After spending some time analyzing the available testimonial and pictoral evidence and considering the actions or activities of the object in question I conclude that there is not enough evidence to prove that the object was not simply an unusually shaped drone operating under control of the person(s) flying the helicopter. Now I have analyzed the pictures. Roughly calculated distances in the picture. The references there are is the helicopter and the shrubs in the foreground. The helicopter is a Bell UH-1Y Venom, which is 17.8 meters long. The shrubs in the desert are about one meter high. 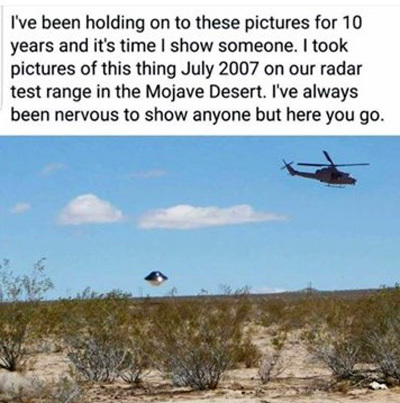 With these measures I can find out that the helicopter is about 20 times farther away from the photographer than the shrub. 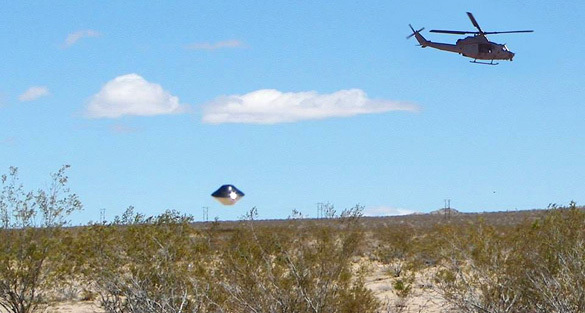 If the object is at the same distance as the helicopter, it has a diameter of about 6 meters and 12 meters if it is twice as far as the helicopter, but to me it is not likely. Accordingly I estimate the object was very close to the camera at the time the picture was taken. If the object is at the same distance as the first bush, it is about 20 cm, but my assumption is that it is closer than that, less than half the distance from the camera to the shrubs, and then it will be less than 10 cm in diameter. The object’s reflected color on the underside shows only sand and ground colours, which is only to be seen between the bushes and the camera, no green from the vegetation. Same effect in the first picture without the helicopter. The dark spot on the ground, which my brain interprets as a shadow from the object, and the object itself is merely an unfortunate coincidence and has no relation, but creates the illusion of a long distance. The real shadows are aimed at the sun, and hard to spot. However, the most crucial fact for the object to be placed close to the camera is the big sunflower / highlight that is on the object. The size of such is proportional to the distance. Conclusion: High hoax factor. No obvious connection with the China Lake Naval Base, except for a similar environment. ”Photoshop” or physical object less than 10 cm. Such a small object could be a toy. The reason for the late answer is that we have just had our annual field investigation course in UFO-Sweden. It takes all of our time in October. Strange and interesting story, I have to say. Here we also see the risk of not having all the information. It may be easy to believe that the previous analysis was poor and insufficient, but with the information available, the result will of course will come afterwards. What makes a person get so scared that you hide the pictures for ten years? No, I do not think the military is so stupid that they fly in an open space with a “flying saucer” if they want to keep it secret. It may be the total opposite instead which is to draw attention. But it may be to be all very conspiratory. Visually, I still think it does not feel right. 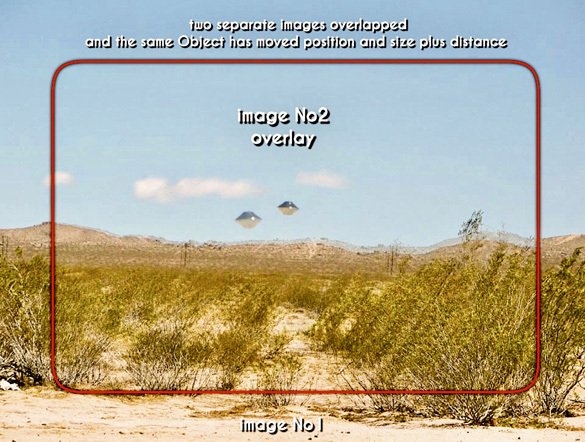 The object (UFO) is blurry in a way that the rest of the pictures are not, and that tells me that something is not what it seems. It can still be, as I said before, that the object is so close to the camera that it is out of focus. Had the object been out of focus because of the distance, it should get something like a bit transparent due to atmospheric depth haze in the atmosphere. If this had happened in Sweden, UFO Sweden would have taken us to the location at “Ridgecrest” and knocked on all doors to look for more witnesses. In recent projects where we did this, it was found that 10 percent of all people had a story they did not mention before. 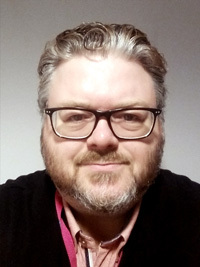 Tobias Lindgren, UFO Sweden and AFU Board Member, born 1972, he lives in Norrköping, Sweden. His interest in UFO study began in the late 1970’s, but only became really active as an ufologist 10 years later. Had been the head of the UFO-Sweden Report Center from 2005 to 2015. In this position, he coordinated Swedish UFO investigations, distributing incoming cases among field investigators. He is now responsible for the UFO-Sweden website. He writes regularly for the “UFO-Aktuellt” Newspaper. He is UFO-Sweden’s image analyst. Tobias is also a skilled computer artist and combines his interests in illustration and computer engineering to illustrate the most recent cases very effectively. He has also studied computer science. mathematics and physics at Linköping University and more recently, visualization and geographic information systems. He is now employed as a GIS engineer at the Swedish Aviation Authority in Norrköping and works with flight information, airplanes and visualization. – The reflection of the sun in the object does not correspond with the position of the sun observed in the shade of the vegetation. – The helicopter is real. SO WHAT ARE THESE PHOTOGRAPHS? In an attempt to get to the bottom on these alleged UFO photographs the have been analysed by five different people from around the world. 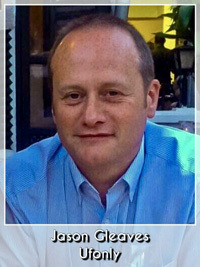 Jason Gleaves from the UK is of the opinion that they are the genuine article. Dr Bruce Maccabee from the USA is not sure whether they are fake or real and the same goes for Tobias Lingren in Sweden. And last but not least Ricardo Varela and Inajar Kurowski in Brazil left us in no doubt that they believe the photographs in question to be fake. It is therefore my hope and intention that by releasing these photographs here that we may learn more about them. Perhaps other specialists will add their comments to those above or maybe someone will come forward who can offer testimony to either support the authenticity of the photographs or the opposite, show us that they are indeed fakes. As yet the photographer does not want his identity revealing which is something I have honoured here but I do have his name on file. Perhaps the photographer will offer more information which will allow us to determine one way or the other the authenticity of the photographs. Until then I think it is only fair to say that the jury is still out. Are these photographs fake or genuine? We shall see. I worked at China Lake from 1979 to 2002, so I wasn’t there when the photos were taken. I can say that the terrain matches that of China Lake, though I can’t identify the particular location. The helicopter appears to be a UH-1Y based on the four main rotor blades and the FLIR pod under the nose. 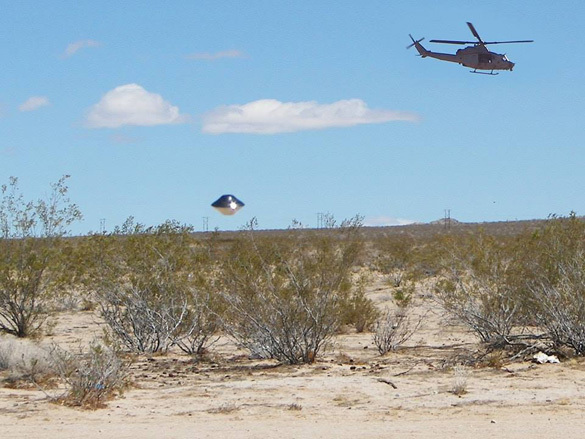 According to Wikipedia, the UH-1Y didn’t enter service until 2008, the year after the photos were taken, though it may have been undergoing testing at China Lake at the time. 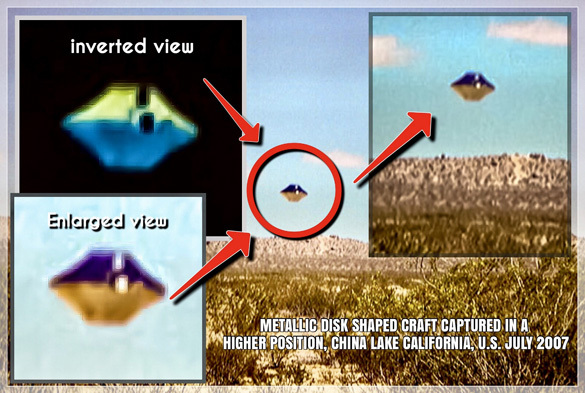 Not surprisingly, I’ve never seen an object resembling the “UFO” in the photos, either at China Lake or elsewhere. 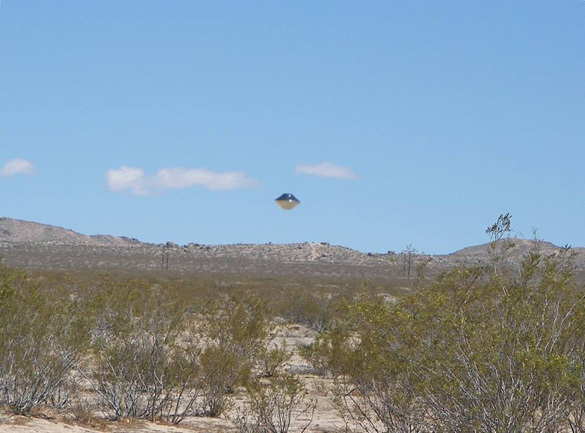 In my time at China Lake, I never heard of any activity relating to UFOs or aliens at the facility. I did hear of a UFO sighted at another facility where I worked in the 1970’s, but that’s another story. Looks fake. The sun is clearly on the right, not behind viewer. Shadows from vegetation go left. The helicopter looks dark, except for the windshield, because the sun is to its right, consistent with vegetation. But the metallic disk is lit by a light source behind the viewer. And its shadow should be to the left of it, not right under it. “Fiber optic camouflage” sounds bogus, only works in one direction if at all. 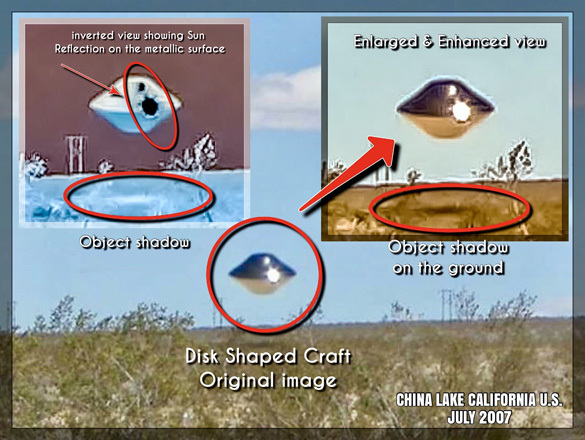 about the ufo foto over china lake. Consider the photo were taken by high speed camera. Bruce macabee seems to be reserved because of short duration of exposure. The person who took the pictures may have not presented the true nature of the camera in order to protect the identity of the true photographer. Looks like a lamp post on a street. Another curious detail – look at the length of the shadows being cast by the bushes. I find it hard to believe that at 11:30am in July, when the sun would be almost as high in the sky as it would get, both for the time of day and the time of year, that the shadows would be of that length. They should be much shorter than that, imo. I am by no means any kind of an expert in Ufology or photo analysis. I would just like to say though that the lower light reflection on the rim of the object when I saw it immediately reminded me of an object I saw with my wife several years ago. The day was very overcast but a disc shaped object hung in the sky for about 5 mins with a round light at the rim that gave you the eerie feeling that you were being watched by an eye. I am right in thinking that the bright light on the rim is assumed to be a light reflection? Is it not possible that this is actually a light source. looking at this (light source) it changes position very slightly as opposed to the light reflection higher up the object that appears to keep position. Just a thought as it is very similar to what I remember seeing, though in my case the object appeared to be Red and not blue/silver. Maybe I have not read this correctly and if so my apologies. “my curiosity piqued” not peeked. Just as a layman, these photos do not past the “eye test,” i.e. 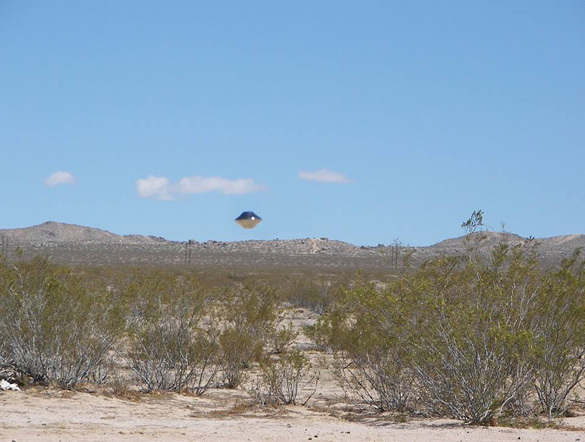 the “UFO” looks fake right away, giving no impression of size, depth, or motion that in any way gives the impression of a real object of any size in flight. Either a model or photoshopped, IMO. After looking and analyzing thousands of photos of this nature, I can say these pictures are real. I find evidence that the time of day would be early eve due to light cast. I would want to question the photographer more for additional info and collaboration of the facts and time these were taken.